Safari 2.0 is only available if you’re using Mac OS X 10.4 or later; Safari 1.3 offers a very similar rendering engine, but is only available on Mac OS X 10.3.9. Like most browsers, Safari provides its version number in the user-agent string it provides when identifying itself to your web server — which means that by examining your server logs, you can tell which version of Mac OS X Safari is running on. So, by looking at the daily logs for daringfireball.net over the last few weeks, we can see how many Safari-using readers were using Mac OS X 10.4, 10.3.9, and older versions of the OS. These figures only regard Safari users. No other browsers were counted — to my knowledge, there’s no way to determine which version of the OS a browser like, say, Firefox, is running on. Web server log analysis is an inexact science. That said, here we go. The numbers in the last four columns are the percentage of Safari users using that version of Mac OS X.
Mac OS X 10.3.9 released, late in the day. Mac OS X 10.4 goes on sale, 6 pm locally. 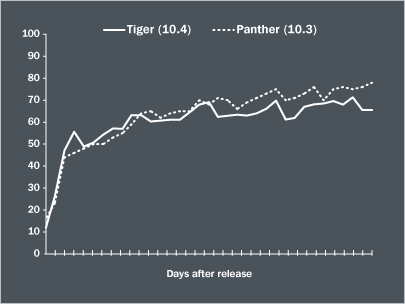 The adoption rate for Tiger seems to be slightly less than that of Panther, but, considering the sloppy accuracy of server log analysis, I’m scoring it as a tie, for now. The Omni Group’s Software Update Statistics site is chock full of interesting stats. For OS version, they’ve got 10.4 at 44.5%, 10.3 at 53.1%, and 10.2 at a measly 2.5%. For CPU type, they have G3 at 5.9%, G4 at 70.9%, and G5 at 23.2%. Which, if you do the math, leaves Intel at zero, for now.